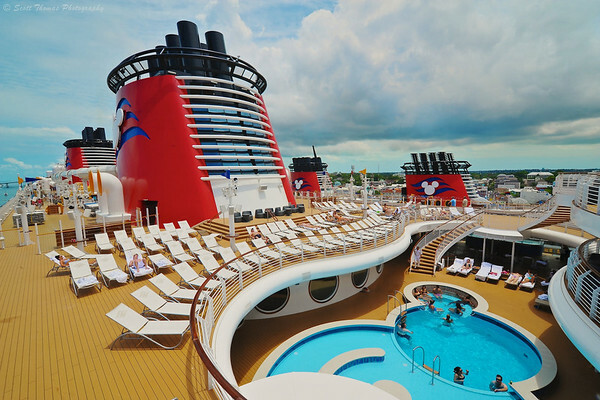 The Disney Cruise Line does cater to families. There are lots of activities and excursions during each cruise families can enjoy together. Disney knew they would also have to cater to adults. Not only adult singles and couples but parents whose children would be in the many kinds of kids only entertainment and programs. Parents know their kids will be safe and take the time to relax. Adult pool area on the Disney Dream cruise ship while it is docked at Nassau, Bahamas. The two Disney stacks in the background belong to the Disney Magic berthed next door. Nikon D700/Tokina 11-16mm, 1/160s, f/16, ISO 200, EV 0, 16mm focal length. The Adult area on Decks 11 & 12 (see above) is a place where adults can relax, socialize, sun bathe, swim, listen to musical entertainment and enjoy an adult beverage from one of four bars within a minute walk from where this photo was taken. 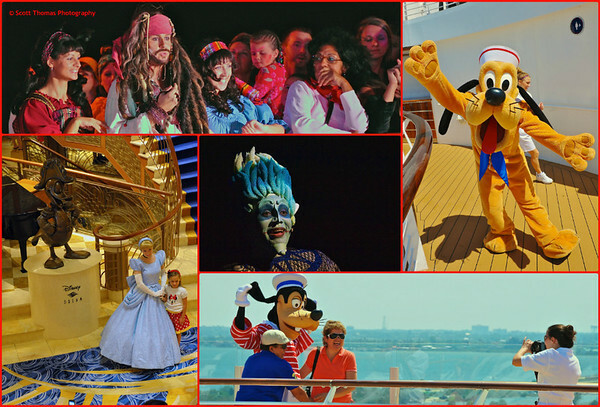 Being a Disney cruise, characters are a big part of the entertainment. In shows under the Funnelvision, in designated Meet and Greet areas on the ship and Castaway Cay, in live theater productions and sometimes just wandering the ship or a beach. Both kids and adults love to see and interact with them. Disney characters on the Disney Dream cruise ship. From top left, Captain Jack Sparrow making his escape during Pirate Night, Pluto poses for the camera, Goofy posing with passengers for a photo, Cinderella meeting young passengers in the Disney Dream lobby and, in the center, Hades appearing in the Walt Disney Theatre production of Villians Tonight. All photos in the collage where taken with the versatile Nikon 28-300mm AF-S VR Zoom lens. 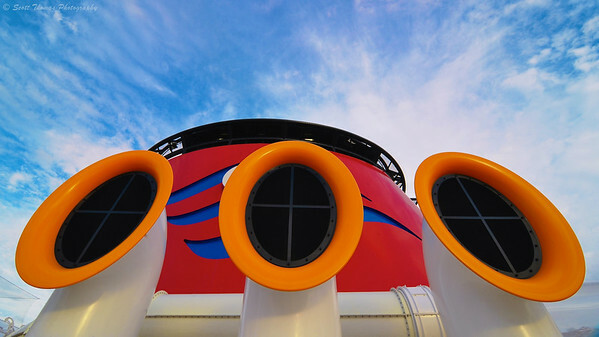 Wide angle fun on the Disney Dream cruise ship. Nikon D700/Tokina 11-16mm, 1/160s, f/16, ISO 400, EV 0, 14mm focal length, cropped. I had a lot of fun using the Tokina 11-16mm f/2.8 Ultra Wide Angle Zoom lens. I found the wide angle lens a great tool to capture the interior and exterior areas of the Disney Dream cruise ship. This entry was posted in Travel and tagged 28-300mm, adult, characters, decks, disney cruise line, disney dream, nikon D700, pool, ship, stacks, tokina 11-16mm, uwa, vr, wide angle. Bookmark the permalink. A Disney cruise looks fab, but I think the next time I hit the seas, I will look for a less family-oriented cruise! 😉 I’ve loved my visits to Disney World, but I’m in a different state of mind on a cruise vacation. I love the perspectives of your photos. That lens seems extremely versatile. Maybe I should look for something similar for Canon. I believe any quality cruise line would be great fun. Cruising is very popular with lots of itineraries to choose from. We were very happy as an adult couple with our experience on a ship full of families. Canon has an 18-200mm for the APS sensor sized cameras. Sigma and Tamron have 18-250mm lenses for Canon. All are image stabilized (IS). We can’t wait to try a Disney cruise!! Your photos will have to do for now…I will be living Disney vicariously through you and Milkay for awhile! 🙂 So glad you had such a great time! You won’t be disappointed when you do, KD.